Looking for that one thing you can do to automatically market and promote your company’s website, products/services, Facebook page, Twitter account, blog, etc. on a daily basis—for FREE? Don’t overlook your email signature! Are you sending out emails each and every day? Some recipients know all about what you do. Other recipients know little about what you do. Still other recipients know absolutely nothing about what you do. Providing non-intrusive information, links, and calls to action at the bottom of your emails gives your recipients the opportunity to learn about you or to refresh their memory about what you offer. It reminds colleagues and friends that, oh yes, you have a blog and they should check out the most recent post or that, oh no, they forgot to Like your Facebook page the last time they looked at it, so they should head over and do that now. 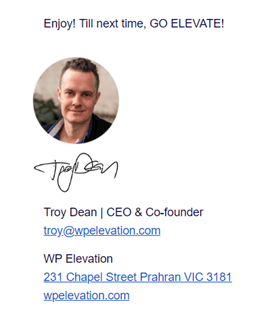 Take 15 – 30 minutes to create an email signature that gets added to the bottom of all your outgoing emails with links pointing to the places you wish more people would look. Those links might point to your Facebook page, Twitter account, LinkedIn profile, company blog, Instagram or Pinterest page, or specific announcements or pages in your website that are new and exciting. Using a strong email signature is like having a captive audience (think: your recipients are sitting at computers or using smart phones when they see them) who’s being shown links and opportunities to learn more and/or connect with you. All without them being made to feel like you’re trying to sell them. Think of all the new people that will learn about your company and social profiles that otherwise would never have known about them. Which of the following links might you add to encourage people to visit or connect with you on the web? Or, you might want to try working backward: What do you wish more people knew about your company? Once you can answer that question, ask yourself what information and links you could include in your email signatures that will encourage people to see these things. And once you’ve figured this out, create your signature, configure your email settings so the signature is automatically added to the bottom of all new emails you send out, then sit back and relax for a few minutes. And smile. You know that now every email you send out is acting as a non-obtrusive, helpful salesman that’s marketing your company at no cost. Showing a photo of a smiling you creates the first building blocks of a social bond, a personal relationship. Photos help people feel like they know you. They make you feel approachable and more likeable. And remember, people want to do business with people they like and trust. The email signatures shown above include great examples of email signatures with smiling, friendly, personal photos that make the senders feel approachable. Are you sold, but unsure how to do this? Are you sitting there scratching your head, wondering how you can create and attach an informative signature to the bottom of all your emails? If you’re looking to keep it simple (text only) or you already know a bit of HTML, you’ll find a countless number of tutorials and step by step walk-throughs if you Google “add email signature XYZ program” (without the quotes, and with XYZ program being the email program you use). And if you’re using an email service provider such as MailChimp, GetResponse, Aweber, etc. these offer tutorials in their Help sections that can walk you through the process. 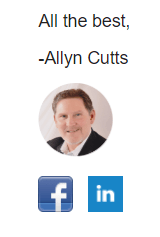 Do you use an email signature? If so, what’s in it? p.s. 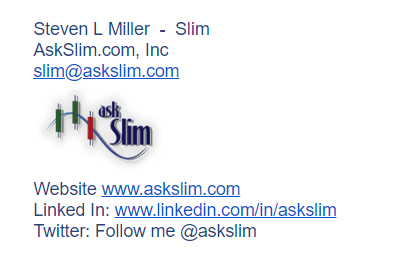 if you want to see our email signature … you will have to subscribe at the top of the page!